Welcome to the Human Rights in Patient Care Website! This site was created to address the legal, ethical, and human rights norms, which are increasingly important to the delivery of quality patient care. In our experience, health systems can too often be places of punishment, coercion, breaches of confidentiality, and violations of the right to consent, rather than places of treatment and care. At the same time, doctors and health practitioners are often constrained in their ability to provide quality care to their patients, or are unaware of how to incorporate ethical and human rights norms into their work. Through this site, you can access materials on teaching, training, and media advocacy on human rights in patient care, as well as a health and human rights video collection. The site further provides a Community of Practice (COP), a place for advocates, faculty, and health care providers to share resources and materials, helping to develop a network of strong practices in promoting human rights in patient care. 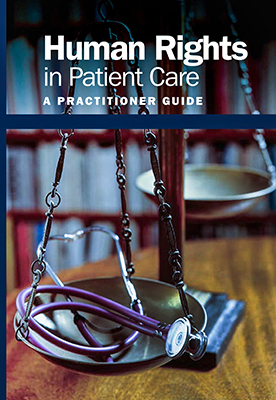 The site also features “Human Rights in Patient Care: A Practitioner Guide”, a series of practical manuals that examine patient and provider rights and procedures for protection at international, regional, and national levels. Full Practitioner Guides are currently available for Armenia, Georgia, Kazakhstan, Kyrgyzstan, Macedonia, Moldova, Romania, Serbia, and Ukraine. The international and regional chapters of the guide are also available in Arabic, Croatian, English, and Spanish. This global website additionally links to country sites focused on human rights in patient care in Armenia, Georgia, Kazakhstan, Kyrgyzstan, Macedonia, Russia, and Ukraine. The field of human rights in patient care is constantly changing and evolving and periodic updates of the Practitioner Guides are available on the country sites. The websites also provide ways to connect lawyers, health providers, and patients concerned about human rights in patient care. By working together, we will be able to improve the provision of patient care and increase human rights protection for both patients and health care providers. Two dedicated journal sections explore the topic of human rights in patient care in depth. In 2013, Harvard’s Health and Human Rights Journal published a themed section on human rights in patient care, enabling more rigorous development of this concept and reflection on work in the field, including legislative advocacy, litigation, and education. Recently, Public Health Reviews has published a special collection on human rights in patient care, which explores various aspects of human rights in patient care, including balancing with public health and bioethics, state responsibility in private health facilities, palliative care, and reproductive health, as well as dimensions relevant to particular populations, including Roma, people who use drugs, and transgender persons. The festival's purpose is to collect and promote advocacy videos from around the world that focus on injustices at the intersection of public health and human rights.